Take a thick -bottomed vessel and heat the sugar and ¼ cup water on high heat. When the sugar melts, add the cocoanut, vanilla essence, ghee or butter and the milk. Cook on medium or low heat till the mixture thickens and leaves the sides of the vessel. Drop a teaspoon of the mixture in a cup of water and if it forms a ball when rolled between the fingers, the right consistency is reached. Grease a flat plate well and pour the mixture on to it. Cool and cut into shapes. Soak the dried fruit and orange / lemon peel in Rum or Brandy for about 1month. Cream the butter and sugar together then add the eggs and mix well. Gradually add all the other ingredients and mix well. Grease a Pudding Mould or any suitable bowl with butter. Pour the pudding mixture into it then steam the pudding for about 1 hour on low heat till it is firm to touch Note: This pudding can be made in advance and refrigerated till required. Steam for 10 minute or microwave for 3 minutes before serving. 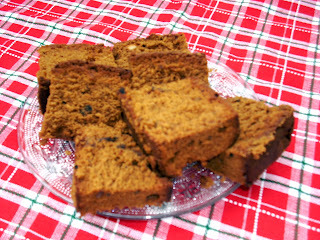 For a more exotic taste, when still warm make a few small holes all over the pudding and pour about 6 tablespoons of rum over it. Sieve the flour with the baking powder. Cream butter and sugar till creamy and fluffy. Add the eggs then mix with the flour. Knead to a smooth batter. Roll out the dough and cut out circles. Line a few pie shells with this. Fill each one with the marinated dry fruit and seal with another layer of the dough. Prick on top with a toothpick. Bake the pies in a moderate oven for about 20 minutes. Wash the fish and marinate it with the salt and pepper and mint for about 10 minutes. Meanwhile make the sauce. Warm the milk with a little water in a pan. Mix in the flour and stir to get a smooth paste. Add the butter, ½ teaspoon ground pepper / pepper powder and salt and mix well. Cook for 3 or 4 more minutes on low heat till the mixture thickens, then turn off the heat. Lay the marinated fish flat in a shallow greased baking dish. Pour the sauce over the fish and shake the dish so that the sauce covers the fish well. Sprinkle the chopped spring onions and the grated cheese over the top. Cover the dish with aluminum foil and bake in a moderate oven (3550) for about 25 to 30 minutes. Serve hot with bread or dinner rolls. Marinate the pork with the salt, vinegar, chillie powder, cumin powder pepper powder, mustard powder, turmeric powder and garlic paste for about one hour. Dissolve the yeast in the cup of warm water. Mix the salt and flour in another bowl and add the dissolved yeast. Mix well to form a thick batter. Cover and let it rest for an hour. Heat the oil in a suitable deep pan. Take scoops of the batter and drop them into the hot oil and fry till they puff up and turn brown. Drain on paper towels. When slightly cold pour the honey over the fried balls and sprinkle sugar and cinnamon over them. The recently released Julie and Julia enthralled cinema lovers and foodies equally. The film, in part, shows the determination of an otherwise laidback Julia Child’s (played by Meryl Streep) endeavours to become a Cordon Bleu cook, her resolve to teach American women the art of French cuisine and the difficulties in getting her first recipe book published. 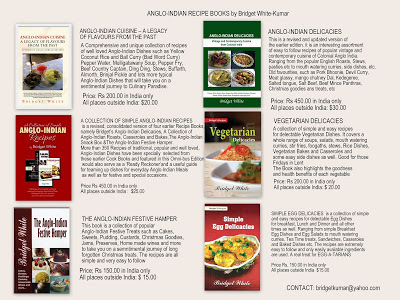 Author of six cookbooks and a blog on Anglo Indian cuisine, Bridget White-Kumar is Karnataka’s very own food ambassador. For Bridget White-Kumar this story could be termed familiar territory. 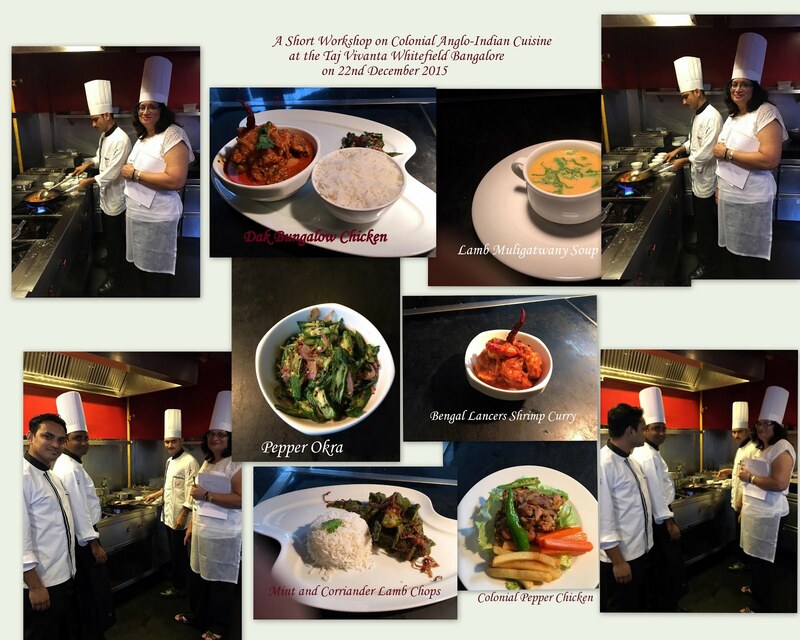 Author of six cookbooks and a blog on Anglo Indian cuisine, she is Karnataka’s very own food ambassador. And, like Julia, the road to getting published was a rocky one for Bridget. A former bank employee, Bridget’s professional life took a 180 degree turn when, after opting for voluntary retirement, she began to document Anglo Indian cuisine. Always interested in food, it was only when her daughter left for higher education to a foreign country that Bridget realised the value of the knowledge she held. “I wrote out some recipes for my daughter,” recalls Bridget. “This became so popular with her friends that we dubbed it the black book. 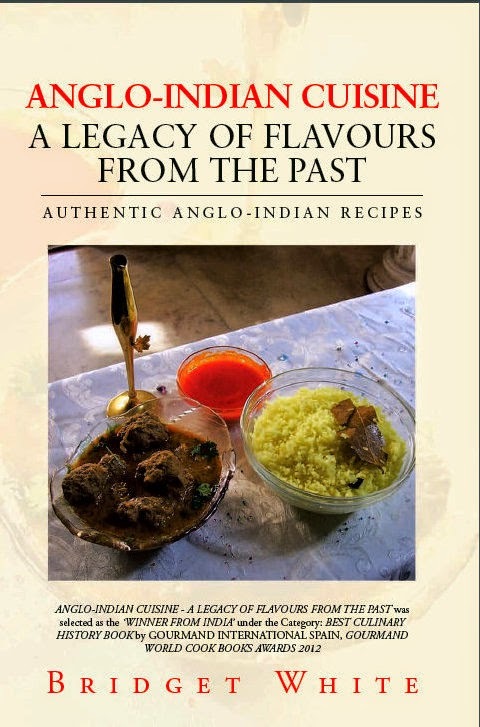 As she kept calling me to clear doubts, I realised that many of these recipes would probably die out if they were not recorded.” It provided the impetus for Bridget’s first book – The Best of Anglo Indian Cuisine – a Legacy, which came out in 2004. With publisher after publisher rejecting her manuscript, by the time a publishing house finally agreed to the book, Bridget was weary of the entire procedure. So she decided to bring it out herself. Despite the high expense that self publishing entails, Bridget has not regretted the decision. “The Internet has been a huge blessing,” she says with a smile. Thanks to technology and the blog, Bridget has been able to market her books so well that she has recovered all costs incurred. Considering that she did not know how to even work a computer before she embarked on her cookbooks, this is no mean feat. There have been no book launches or media blitzes either, but word of mouth did the rounds and the resultant press write-ups propelled Bridget into the limelight. Publishers also took note. Bridget’s seventh book, currently with a major publishing house, will soon be out. And her eighth – a nostalgic look at life in Kolar Gold Fields (KGF), has been published by Author House UK. 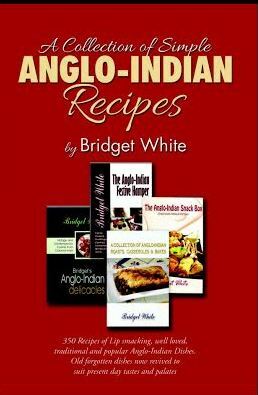 The Best of Anglo Indian Cuisine - Bridget White-Kumar. 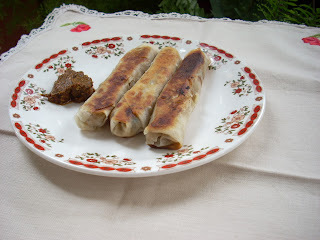 Bridget, who grew up in the close knit mining community of KGF where a large percentage of the population were Anglo Indians, believes that Anglo Indian cuisine is the first instance of fusion food in India. “It is a confluence of various cultures, not just Indian and British,” she says. 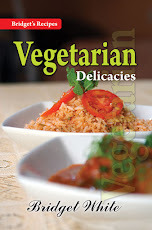 “Even within Anglo Indian communities in different parts of India, the ingredients for the same dish can vary. In Cochin the use of coconut will be more, while in Calcutta the oil used would be mustard. But whichever the region, the use of spices remains constant. The judicious use of spices is the defining trait of our food. Not spicy and not bland,” she adds. Bridget’s favourite meal is yellow coconut rice, mince ball curry and pepper chicken. It is a reminder of her childhood. And of a past that she remembers with clarity. With four generations of Whites in the mining sector and a family home in Robertsonpet in KGF, Christmases especially were a great time for merriment and feasting. “My father was a mining engineer and we lived in huge rambling quarters in KGF. There were four mines and each mine would have their Christmas function; with a tree, games for children, Santa distributing goodies, a funfair with food stalls where coconut puffs and marshmallows were favourites and the Christmas dance which began at 9 in the night and wound up by 5 in the morning! The dance was a big event; people would come from Chennai and Bangalore to hear the groups playing,” she says. It is recollections like these that you will find in her yet to be published book. 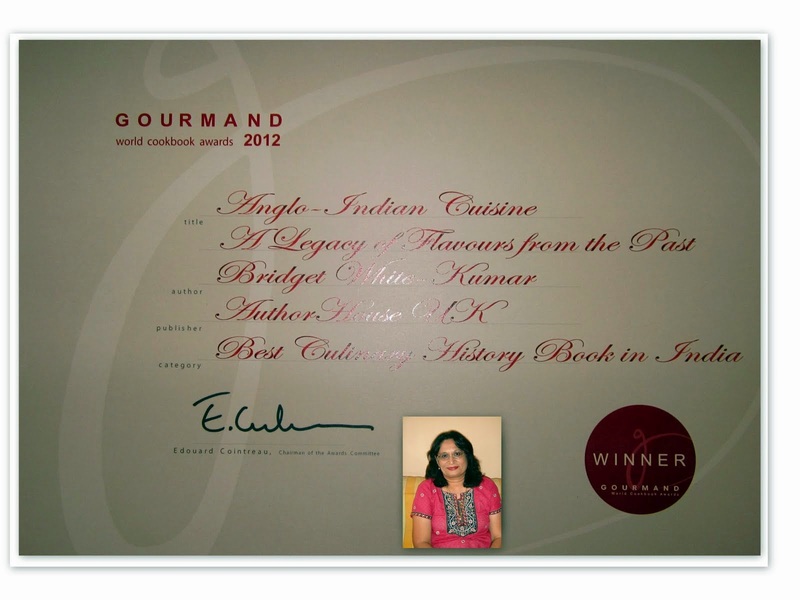 People like Bridget White-Kumar prove that you do not have to be an academician or historian to bring the past alive. She could have led an ordinary retired life but, with her perseverance in documenting the food of a dwindling community and her resolve to pen memories of a world that has disappeared, she has chosen to tread a different path. Shift the flour, baking powder and salt together. Dust the orange/ lemon peel and chopped black currants with a little flour. Cream the butter and sugar well. Add the egg yolks, date syrup, cinnamon and clove powder and vanilla essence and mix well. Add the orange/ lemon peel and black currants. Slowly add the egg whites and flour and fold it well. If the mixture is too thick add a little milk. Pour into a greased and papered baking tin or dish and bake in a sow oven for about 40 to 45 minutes. Remove from the oven when done and set aside to cool. 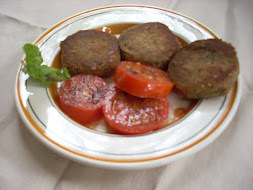 .Wash the chops and marinate them with the ginger and garlic paste, pepper powder, chillie powder, vinegar, cumin powder, coriander powder and salt for about 30 minutes. Heat oil in a large pan and sauté the onions and green chilies for a few minutes. Add the marinated chops and mix well. Simmer for a few minutes. Add sufficient water and cook till the chops are done and the gravy dries up. Keep frying on low heat till the chops turn a nice brown colour. Garnish with onion rings. 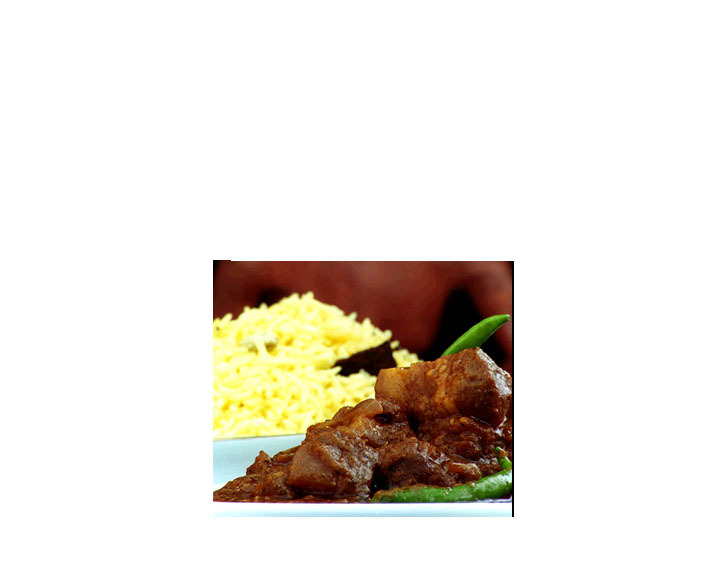 Railway Lamb / Mutton Curry is a direct throw back to the days of the British Raj, when traveling by train was considered aristocratic. This very popular and slightly spicy dish was served in Railway Refreshment Rooms and on long distance trains, with Bread or Dinner Rolls. The curry was not too spicy keeping in mind the delicate palates of the British. It was also popular with the Railway staff who had to be on duty for long periods at a stretch. 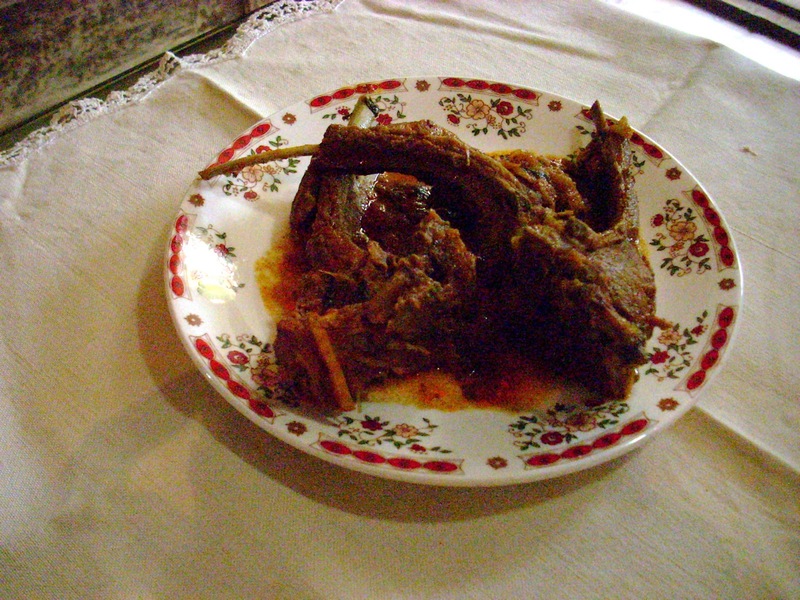 The vinegar or Tamarind juice used in its preparation would ensure that the curry would last for quite a few days and was an ideal accompaniment with rice as well. The recipe for this dish is sure to bring back some happy memories. 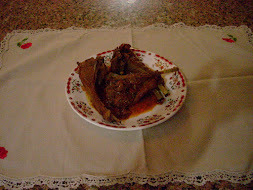 Wash the meat and mix it with the ginger garlic paste, salt and the chilly powder. Heat oil in a pan and fry the onions, curry leaves, red chillies and spices till golden brown. Add the meat and mix well. Fry for a few minutes. Add the vinegar / Tamarind juice and sufficient water and cook on medium heat till the meat is done. Keep frying till the gravy is thick and dark brown. For the Dough: 250 grams refined flour or maida, 50 grams butter, ½ teaspoon baking powder, 1 teaspoon salt, ½ kg oil for frying. Sift the flour with the salt and baking powder. Mix in the butter and knead to a fairly stiff dough with very little water. Keep aside for 1 hour. Take the dough on a floured board and roll out into a thin sheet. Cut squares of about 2 to 3 inches per side. 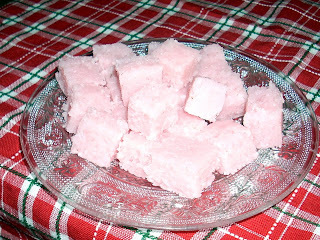 Put a tablespoon of the sweetened coconut on half of the square. Fold the other half over in such a way to form a triangle. Seal the edges by dampening with a little water. Heat the oil in a deep pan till smoky. Slowly drop in as many puffs as the pan can hold and fry till brown on both sides. Remove from the pan and drain. Note: These puffs can last for a fortnight if dry cocoanut or copra is used instead of fresh coconut. Remove the crusts from the bread slices and break into small pieces. Take a baking dish and grease it. Spread the pieces of bread in it. Mix the milk, beaten eggs, sugar, vanilla essence and butter together and pour this mixture over the pieces of bread soaking them completely. Sprinkle the nuts on the top. 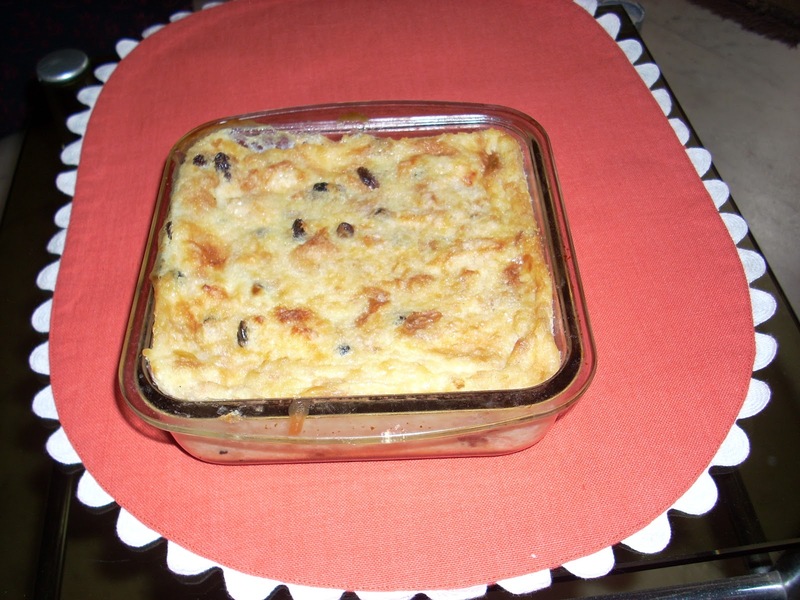 Bake in a hot oven for 20 to 30 minutes. Heat oil in a pressure cooker and lightly sauté the onions. Add the trotters, spice powder, chillie powder, tomato, coriander powder and salt and mix well. Add sufficient water and pressure cook first on high heat then on low heat for half an hour till the trotters are well cooked. Garnish with chopped coriander leaves. 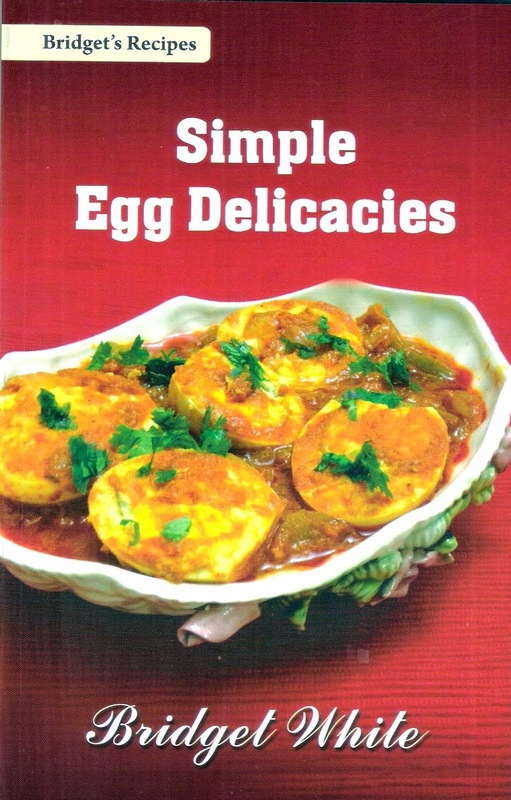 Serve hot with rice or bread or even dosas or hoppers. Wash the tongue well and then pressure cook it with 2 cups of water and a little salt till tender letting some soup remain. Open the pressure cooker and remove the boiled tongue. Let it cool for some time. When it is a little cold remove the white skin from the tongue and put it back into the open cooker and add the oil, onion, red chilies pepper corns, cloves and cinnamon and a little more salt. Mix well. Simmer on low heat till all the soup dries up and the tongue is nicely brown all over .Cut into slices and arrange on a plate along with the residue. Serve hot or cold with mash potatoes and bread. You can make very delicious sandwiches with tongue roast as filling. Take a flat bottomed baking dish and grease it well with butter. Boil the milk and keep aside. Pre heat the oven till slightly warm. When the milk is slightly cold add the eggs, vanilla essence, flour and sugar and beat well till there are no lumps. Pour a thin layer of this mixture into the baking dish and let it set in the warm oven till it forms a base. Take out the dish and arrange the Jelebis in it. Pour the rest of the mixture over the Jelebis and bake for about 15 to 20 minutes till the custard sets and is golden brown on top. The custard should be moist and not dry. Garnish with sliced cashewnuts or pistachios. Wash and dry the meat well. Puncture holes all over it. Mix the salt, saltpeter and brown sugar together. Divide this mixture into 4 parts. Rub the Beef all over with one portion of the salt mixture and juice of 2 limes. Turn the beef around so that the salt solution seeps into it well. Repeat this after every 2 hours rubbing it well several times during the day. Next morning remove from the old dish and place it on another dry dish, and rub into it the second portion of the prepared salt. Let it stand for an hour or so, then pour over it the remainder of the 2nd portion of the salt solution. Repeat the rubbing two or three times during the day, turning the beef continually. On the 3rd and 4th day repeat the procedure of placing in a fresh dish and rubbing the beef well with the 3rd and 4th portions of the prepared salt solutions and lime juice. On the 5th day boil or pressure cook the meat with all the residue of the salt solution for at least 1 hour on low heat. Cool and store. Use for sandwiches etc when required. Make a paste of the mustard with about 6 tablespoons of water. Heat oil in a non-stick pan and fry the mustard paste and turmeric powder for about 5 minutes on low heat. Add 3 cups of warm water and mix well. Bring to boil. Add the fish, green chillies and salt and cook on medium heat till the fish is cooked and the gravy thickens a bit.